Being At The Right Time And Place! Being at the right time and place is everything when you want to make it the fashion, apparel and watch industry. Getting an endorsement from a well-known public figure is always beneficial. Numerous fashion and accessory designers owe some of their widespread popularity to a celebrity or prominent public figure wearing their item in public. In 1983, Ray Ban Wayfarer sunglasses enjoyed a major resurgence in popularity when Tom Cruise wore a pair in the film Risky Business. Meanwhile, The TAG Heuer Kirium watch became extremely popular in 1997, after Cruise was spotted wearing one in the film Jerry Maguire. Breitling wristwatches also grew in popularity in the 1990s, after being spotted on the wrist of popular comedian Jerry Seinfeld, who wore one each week on his highly-rated television series. More recently, American watchmaker Jorg Gray catapulted into the public eye when President Barack Obama was seen wearing the 6500 Chronograph, during his political ascendance in 2008. The watch, a birthday present from his Secret Service security detail in 2007, was seen on Obama’s wrist throughout has 2008 campaign and appeared in many photographs and magazine covers. Founded in 1998, Jorg Gray originally started as a private label watch company. Shortly after Obama’s inauguration in 2009, the brand launched an e-tail site called Barackswatch.com and entered the global watch market that same year with appearances at the Baselworld Watch show in Switzerland. Jorg Gray’s well-crafted, handsomely appointed collections have caught the eye of many in the past six years and have led to its worldwide popularity. 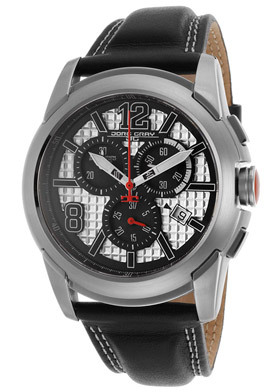 You’ll find a wide variety of Jorg Gray wristwatches at online retailer The Watchery. The Jorg Gray 9400 Chronograph is one of the brands’ outstanding timepieces featured on the site. This high-performance men’s watch has a generously proportioned stainless steel case and genuine black leather strap with contrasting white stitched detail. The brushed steel bezel surrounds the striking textured dial with three subdials, an automatic date calendar, luminous sword hands and outlined hour markers. Swiss-made quartz movement inside provides time-keeping accuracy. Features include a screw-down crown and caseback for water resistance to 100 meters or 330 feet. Watch is 45mm in diameter and 15mm thick.